This is an excellent value for a driver of this amperage rating. There are a few negatives, however: - Zero documentation. You have only the ratings from the description, and what's printed on the PCB. One 'gotcha' with many of these controllers is the maximum duty cycle: in some designs you must have some minimum pulse width (i.e. 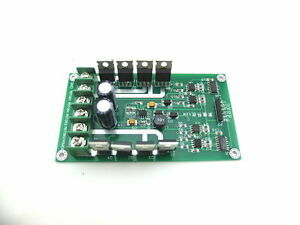 the pwm input not stuck high constantly) in order for the MOSFET gate driver circuitry to work correctly. - Chip labels sanded off. If the unit dies, you have to replace the entire thing. I have bought several, as my first mysteriously overheated in one of the channel's drive logic. I still am not sure what caused that--me or the unit.